In other words, make sure you aren’t holding an unrealistic standard for yourself. Breaking resolutions to stick to overly restrictive eating plans is not overeating. Let’s say you are someone trying to maintain a too-low calorie intake; for example, 1,300 calories per day. If you go over your “allowed” amount of calories and think you overate, you may hear faulty thoughts telling you that you “have no self-control and you might as well binge and then start over tomorrow.” Remember that voice making excuses for binge eating is from the lower brain; those thoughts are not logical or rational and don’t need to be given any value or attention. Of course it makes no sense to binge because you have eaten more than your restrictive diet allowed. But, if you continue down the path of not giving your body enough food, the binge urges will persist and giving into them will be inevitable. The best course of action is to abandon the restrictive diet, not abandon your resolve to stay binge-free. 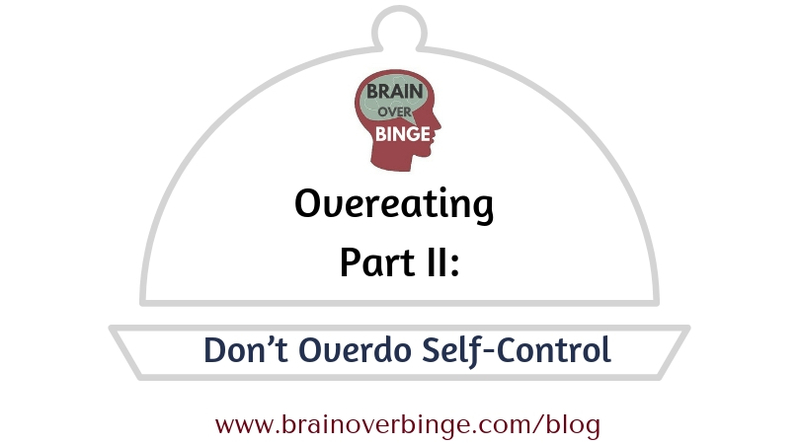 When recovering from binge eating, I think it’s best to use the “nifty strategy” of self-control primarily for binge eating and not worry much about overeating or any other eating imperfections. If you start trying to dismiss every non-hungry craving, or try to detach from every thought encouraging you to eat a few more bites, you will wear yourself down. This doesn’t give you a pass to overeat all of the time; it only means to avoid putting so much pressure on yourself to get your eating exactly right. If you find yourself having a few more bites (or another serving) when you are already comfortably satisfied, it’s okay. Just move on, and put your focus on dismissing the binge urges. To help you put aside your overeating concerns for now, it may help you to write those behaviors down. That way, you know aren’t ignoring any eating behaviors that you feel are problematic. You are fully acknowledging them, but you are disconnecting them from your binge eating recovery. Keep your list in a place where you can come back to it after binge eating stops. You may find that some of the overeating habits go away on their own with the cessation of binge eating, and you also may find that what you considered “overeating” simply isn’t a big deal after recovery and there is no need to address it. Conversely, you may find that some of the eating issues do indeed interfere with your life after binge eating stops and you need to work on them. Welcome to the world of normal eating! Another benefit of having your overeating habits or any other problematic eating behaviors written down, is that you’ll be less likely to fall for those lower brain thoughts that tell you that you “might as well binge” because you aren’t eating perfectly. You can detach from those harmful thoughts, remembering your list and that you will work on resolving overeating or any other eating problems after recovery, if you deem it necessary when that time comes. If you find that you’ve eaten in a way that isn’t ideal (but is not a binge), then just add it to your list, and acknowledge that it’s something you may need to address at some point in the future when you are binge-free. Don’t over-think it; don’t dwell on it; don’t put yourself down because of it; and most importantly: don’t think that you are destined to binge binge because of it.